The GVD4 Explosives Vapour Detector has been developed from the earlier PD3 series, and is similar to equipment supplied to the British Army under NATO Stock number Z5/6665-99-225-1652. 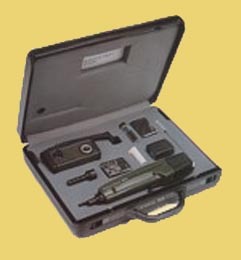 The Detector, which is completely self-contained and designed for single-handed use, is supplied in an executive-type briefcase which also houses the following accessories: - battery charger, spare battery pack, earphone, interchangeable probes, test sample in container, first line spares kit, cleaning tools and instruction handbook. The GVD4 is extremely simple to operate, the number of controls being reduced to one- a weather-proof on and of switch. the unit automatically adjusts to the surrounding environment, thus alleviating possible operator error. Warm-up time is only about 10 seconds and a low frequency tone will be emitted when the unit is ready for use. When the equipment is switched on, a continuous sample of air is drawn in via the nozzle. A concentration of explosive vapour in the sampled exceeding 1 part in 109 by volume, will cause the instrument to emit a high-pitched tone. the frequency excursion of the tone is an approximate measure of the concentration of explosive vapour sampled. The source can be located by passing the probe across the area from which the response was obtained and listening to the variations in response. when desirable, the tone can be fed through the earphones so that it is audible only to the operator. a red light, which is visible to the operator, but not to the person being searched, also appears when a strong sample is detected. The GVD4 is powered entirely from its own 12v rechargeable battery pack, which is connected to the unit by a quick release weather-proof connector. A fully charged battery will last for at least 4hours continuous use, or 8-12 hours when used intermittently during typical search conditions.